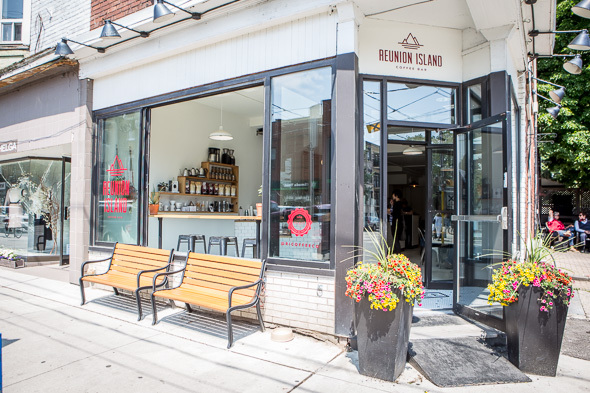 Reunion Island Coffee Bar proves Roncesvalles still hasn't reached its cafe saturation point yet, replacing Roncy's Bean with this first flagship shop of the 20-year-old Oakville-based coffee roaster , which went through a major rebranding last year. 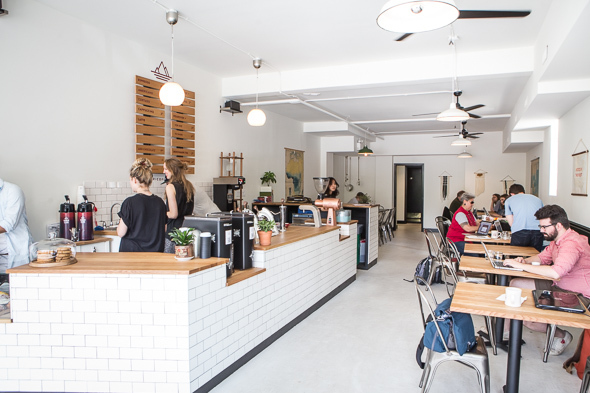 The cafe space now looks and feels very different from its predecessor, while also reflecting Reunion Island's rebrand; it's bright and minimalist, with cute - and highly Instagrammable - floor tiles that spell out "COFFEE" at the entrance. And that's what the focus is on here - the coffee. 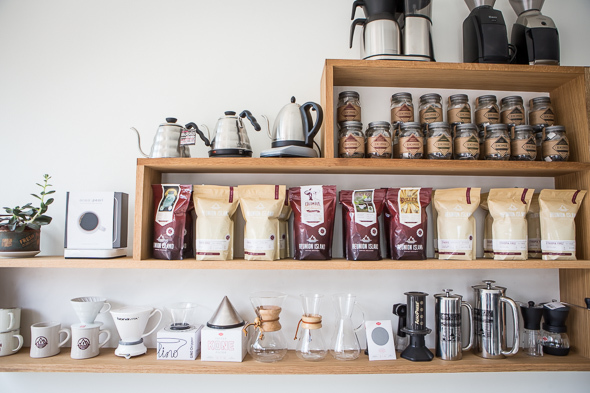 This cafe allows Reunion Island to control all the variables involved in making the stuff, from sourcing the beans to brewing, so that it can be served exactly the way the it wants the end product to taste. 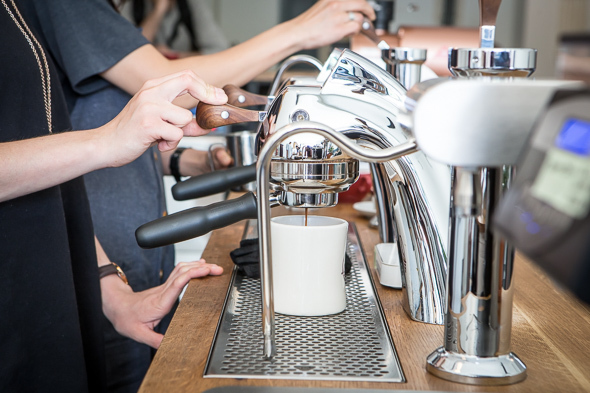 In terms of equipment, they use the impressive Modbar espresso system here, which saves counter space and allows baristas to work efficiently (the module hidden below the counter looks like a stereo receiver, but actually creates and repeats pressure profiles, among other magical things) while facing and interacting with customers at the same time. 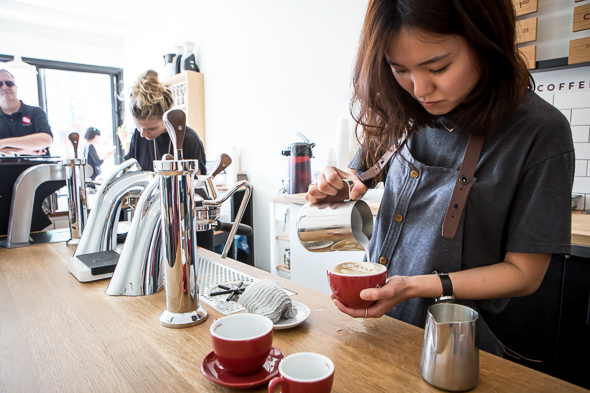 While Reunion Island also roasts blends, seasonal single origin beans are featured in the cafe. Adam Pesce, the brand's director of coffee, explains these are all light roasts to honour the work of the coffee bean farmers. He compares roasting these beans to cooking meat; don't over do it or you'll homogenize and effectively kill the subtleties in flavour. Different single origin beans are used for certain drinks in order to highlight the processes they go through; for example, when we visit, Ethiopian YirgZ is used to make espressos ($3) and Americanos ($3.25) while Ethiopian Harrar Mesela is used for cortados ($3.50), cappuccinos ($3.75) and lattes ($4). 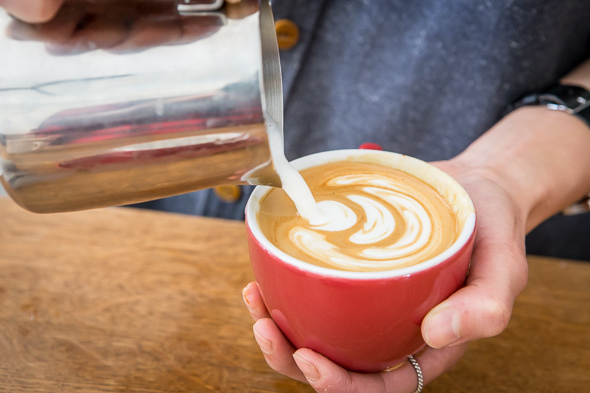 Harmony Organic goes into espresso-based drinks that contain milk, and the super smooth latte I try is near perfect as served. Decaf, filter (small $2.25, regular $2.75) and pour over ($3.50 for one, $6 to share) coffees, as well as Reunion Island's own brand of Benchmark teas ($2.75), are also available (there's a kids menu too), but the perfect summertime beverage du jour to try is the cold brew & tonic ($4). 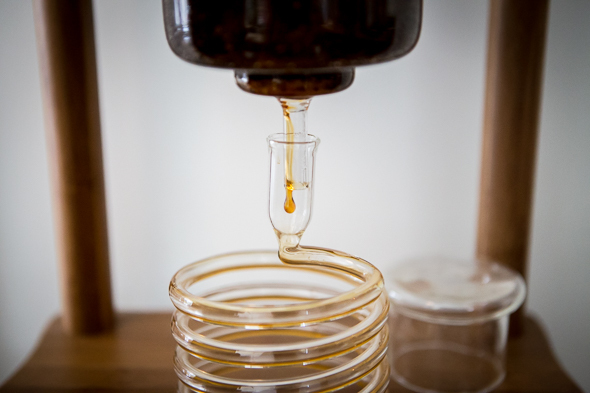 A three-piece science experiment-like contraption brews the cold coffee (using the citrusy YirgZ beans) for 12 hours and is pretty mesmerizing to watch. Tonic water and ice is added to the final product, and voila -- you've got a fizzy and sweet carbonated coffee. Pesce tells me people are hooked and have been coming in for it every day. 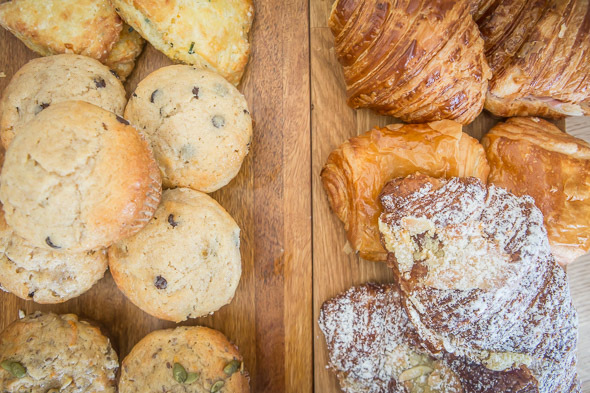 Various baked goods come from Bunner's (for vegan and gluten-free goodies), The Tempered Room and La Bamboche . A small retail area sells 12-oz bags of Reunion Island's beans, including its classic signature blends ($13) and limited "small lot" series of single origins ($16), its Benchmark teas ($15.95/jar), plus all the best gear needed to make coffee at home. 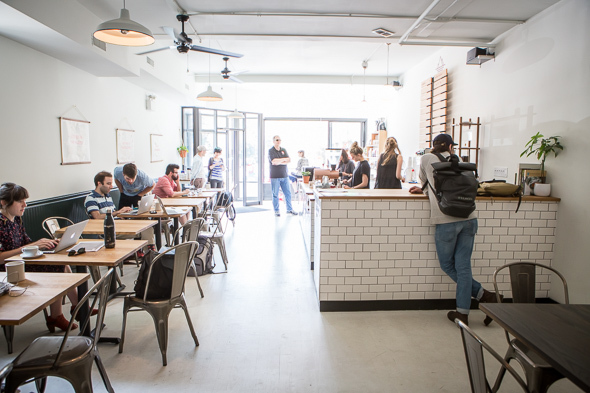 This may be another coffee shop in an area that already has quite a few options, but when we visit, it's already filled with freelancers (it's seriously laptop city inside). "You can't live in this neighbourhood and not want to be a part of it," Pesce says (he lives nearby). "The community aspect of this space is really important." It seems the locals agree.